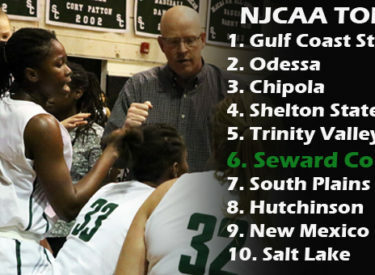 Two more wins turned into two more spots up in the NJCAA Top 25 Poll for the Seward County Lady Saints on Tuesday as the gals in green rose to #6 in the country, their highest ranking since the January 28th poll of 2015. The Lady Saints had no trouble in moving to 11-0 on the year this week, earning a pair of blowout wins against Allen and Neosho County. Wednesday on the road at Allen, Seward outscored the Red Devils 47-16 in the second half to leave Iola with a 79-48 win. Saturday in front of their home crowd in the Greenhouse, the Lady Saints put on a clinic against Neosho County, bombarding the Panthers for a season high 110 points in a 56 point victory. Seward moved to 11-0 overall and 9-0 atop the Jayhawk Conference standings at the end of the first semester of action with the wins. The top five in this week’s poll all stand pat from last week as Gulf Coast remains in the top spot with Odessa, Chipola, Shelton State, and Trinity Valley behind them. Seward is trailed by South Plains at #7, Jayhawk rival Hutchinson at #8, New Mexico at #9, and Salt Lake to finish out the top 10. Cowley moved up three spots to #22 in the poll while Butler drops out after a one week stay. Seward will have the next two weeks off before returning to the court in Pensacola, Florida on December 28th and 29th where they will take on Patrick Henry and #4 Shelton State in the Pensacola State Christmas Classic.